It was a very good year, as Frank Sinatra sang, in the field of social media for the federal government. Advances were made not only in the technologies applied by agencies, but also the policies and strategies that unlock their potential to improve services and reduce costs. I’d like to share with you just some of the programs that made 2013 a very good year for the SocialGov community, what the challenges are that we’ll face in the coming year, and also give you insight into what to expect in 2014 as we overcome those emerging challenges together with you. To break the ice, let’s start with an agency it’s easy to find among the stars: NASA. The space agency’s Twitter account is the most followed in government, and their innovators like Jason Townsend are always looking for new and better ways to engage their community. 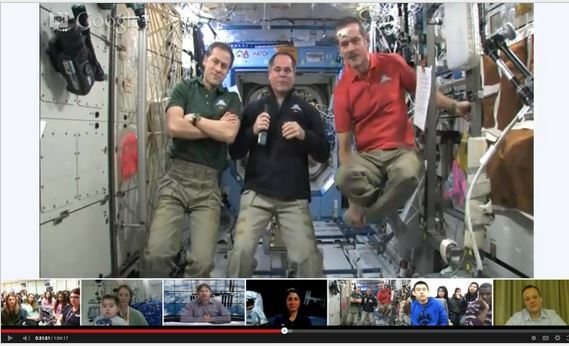 NASA hosted two Google Hangouts with astronauts aboard the International Space Station — programs like these shatter the mold for what limits other agencies think exist, and open the door to better programs across mission fields. 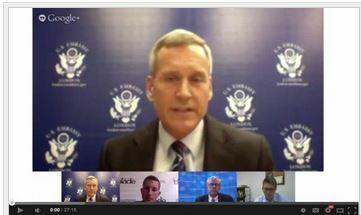 For example, the State Department Bureau of Consular Affairs analyzed NASA’s Hangouts, and decided to use this strategy in August to address questions about the new visa application process for couples to an audience of almost 20,000 citizens. That’s just one approach though — in 2013 agencies diverged from only engaging on one or two main platforms and expanded to look at a fuller breadth of options to improve their mission. Agencies now have more than 60 social media apps available to them with federal-friendly terms of service negotiated, allowing them to better select which method is best for engagement. The Department of Interior, for example, quickly found success with Instagram by providing citizens with just a small taste of the national park experience via their mobile devices. The Department of Health and Human Services explored Data Vines that tell a numbers-driven story in six animated seconds. The Peace Corps illustrates for us their global mission through local eyes with Pinterest. The Office of the Director of National Intelligence launched a Tumblr to provide better access to information about the Intelligence Community. And Ready.gov and FEMA use integration platforms like Thunderclap that integrate the other standard platforms through citizen participation and deliver the greatest impact. Agencies even gotten their feet wet in the viral space with Buzzfeed posts and animated gifs. What’s next? More diverse and specialized tools and platforms for agencies are always in the review process for application to public services and terms of service. From performance analysis and management dashboards, to annotation and feedback tools, or better mobile image sharing, agencies will continue to gain new and more effective ways to reach, engage and listen to their communities. The examples go on, but they illustrate that gone are the days when the measure of an agency’s social media footprint is how many followers they may have on one platform. Also, the success of a social media program is not only in using a tool or strategy, but how they measurably improve the performance of your mission. A prime example is how in 2013 Nicole Callahan, Abraham Martinez and the Department of Education Federal Student Aid team turned their social media program into a digital customer service powerhouse that would be the envy of any organization. 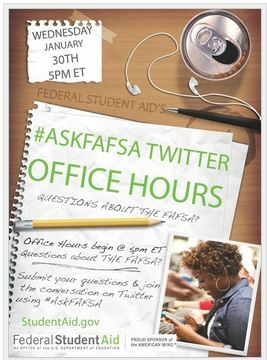 Each month they hosted online office hours using the #ASKFAFSA hashtag on Twitter to answer up to 150 questions per hour, and more than 50 percent of all posts from across platforms were all responses to questions from citizens. They serve as a model example of how an agency can take their social media program beyond simple outbound communication and use it to significantly make the core customer experience of citizens better. Social media can be used for more than improving engagement with citizens, though — it’s used to improve the policies and practices that govern our programs themselves. 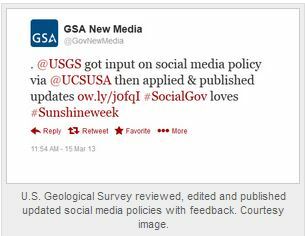 One of our favorite examples was when the Union of Concerned Scientists released one Friday morning a study of federal agencies’ social media policies and graded them on provisions for scientific transparency. As soon as it was publicly released through social media, our SocialGov Community shared it and began analyzing. Scott Horvath at U.S. Geological Surveysaw how the feedback could improve their own policy, and so by that afternoon he drafted, approved and distributed an update. What’s next? More. 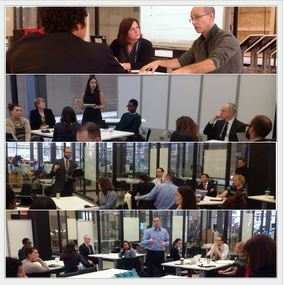 We want to hear more of these applied innovation stories in 2014 as agencies, our partners and stakeholders increasingly use social media to make their operations faster and more effective. To achieve this we need you to not only know this level of performance is possible, but that it’s already happening in agencies and through your support it will continue to spread. We demonstrated in 2013 that large-scale collaborative projects between diverse mission fields can be achieved through social technologies and strategies, and we are already planning to deliver more shared resources for government in 2014. Already in development are programs for entrepreneurial support, public prizes and competitions, regulatory participation and a new and updated toolkit to expand on our accessibility program. Our collaborations in 2014 will not just improve government-wide shared services, though — they will better connect and address challenges for our programs at the ground level. Community-building through social media helped the Federal Trade Commission host the RoboCall Challenge, which invited citizens to develop new ways to block illegal robocalls to mobile and landlines. Almost 800 solutions were submitted, and one entry is already on the market for consumers. What’s next? Whether through mobile development with the Mobile Community, innovative prize competitions through Challenge.gov, the members of our SocialGov Community will continue to work across offices, agencies and missions to modernize and improve public services and meet the challenges of tomorrow. How are we going to face these challenges in 2014? Together. The shared services model we use helps us to not only share guidance, recommendations, and tools like the Federal Social Media Registry — we also use our strength of numbers across agencies to share knowledge of everything from adjustments in platform algorithms, reviews of the newest tools, and the analysis of our legal, privacy and security teams. 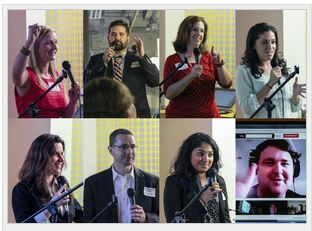 The SocialGov Community may be only one-deep in some agencies, but that one person has the collective support and knowledge of more than 130 agencies at their fingertips. Finally, considering all these examples and points made, the question arises “What is the top thing you think we should look forward to from social media in government in 2014?” The answer, Social Data, may only be two words but the coming benefits and innovations are sweeping in their impact. We see it when the Centers for Disease Control and Prevention challenges citizens to use social data to predict the outbreak of flu, and when theU.S. Geological Survey uses it to explore early warnings for earthquakes. Twitter worked with agencies to launch Twitter Alerts, an important first step in using verified social media from government for emergency management. Using social data, however, developers can already go farther with entire verified streams for a wide array of public services for desktop, mobile and eventually wearable devices. The Department of State’s Bureau of Consular Affairs released a new API through Data.gov to share travel warnings and travel alerts with U.S. citizens traveling or living overseas. In 201The Department of State’s Bureau of Consular Affairs released a new API through Data.gov to share travel warnings and travel alerts with U.S. citizens traveling or living overseas. In 2014 your start-up could be one of our best examples by integrating the API with other streams of their social data into websites and mobile applications such as tourism guides and online travel agencies. This is just one example of an opportunity that can be increasingly found in missions across government. Physical services that help develop “the internet of things,” such as how interestingly in Australia they tagged sharks so they emit a warning tweet when they swim close to the shore, and how entrepreneurs are developing “social machines” that perform functions based on social data commands. We have a lot to look forward to in 2014, but only through your participation and engagement can we successfully unlock the full potential of social media in government. I’d like to invite you to join all of us in the community, whether you’re a federal employee, small business, entrepreneur, researcher, developer, student or just a very opinionated person — no matter what role you can play in developing programs and services that make people’s lives better, we have a spot waiting for you right beside the #Socialgov hashtag.